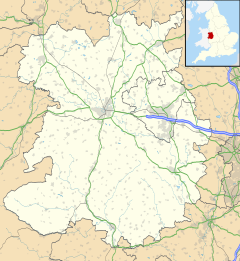 Quatford is a village in the Severn Valley, Shropshire, England. It is located on the A442, just south of the town of Bridgnorth and on the bank of the River Severn. Quatford is one of the oldest settlements in the area. It was listed in the Domesday Book, the draft of which was finished in 1086. Quatford was settled because of the ease of fording the River Severn. Its name came from it being a ford near Quatt. As the River Severn became deeper a bridge was built at the site instead. In the 11th Century a small castle was built on high ground overlooking the river, but was demolished a few years later. Traces of the motte still remain. Quatford's importance as a crossing of the River Severn was diminished when another bridge was built 2 miles upstream. A settlement was formed at the "bridge north of Quatford", now known as Bridgnorth, which became the major town in the district. North of the village is a mock castle now known as Quatford Castle. It was built circa 1830 by John Smalman for himself and originally called Morf Mount; later, it became the residence of Smalman's grand-nephew, Henry Edward James Bevan. ^ "Quatford Castle". britishlistedbuildings.co.uk. Retrieved 2011-05-07. ^ Shropshire Archaeological and Natural History Society (Great Britain) (1902), "Sequestration papers of Thomas Smalman of Wilderhope", Transactions of the Shropshire Archaeological and Natural History Society, Adnitt and Naunton, p. 15 . ^ Henry Robert Addison; Charles Henry Oakes; William John Lawson; Douglas Brooke Wheelton Sladen (1901), Who's who, Volume 53, A. & C. Black, pp. 157–158 . This page was last edited on 20 March 2018, at 20:29 (UTC).